Emma Jane (Minerd) Trout was born in September 1853 in Connellsville, Fayette County, PA, the eldest daughter of John V.S. and Elizabeth (Livingston) Minerd. With her parents, she moved to Ironton, Lawrence County, OH as a young girl. After her father's discharge from the Civil War, the family moved back to Dunbar, Fayette County, for good. 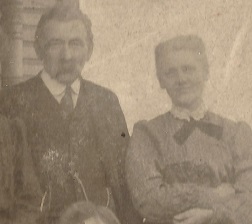 In about 1870, at the age of 17, Emma married 23-year-old Isaac Franklin Trout (1847-1911). He was the son of Philip and Margaret (Phelobaum) Trout. His birth year also has been given as 1844 and 1848. They produced five children -- John Minard Trout Sr., twins Mississippi Trout and Missouri "Dollie" Trout, Earl Calvin Trout and Anna Belle Hower. The twins, born in September 1882, were premature. They weighed a few pounds each and were not expected to live, and were named either for the rivers or the states. Sadly, little Mississippi died within a short time, while Missouri is said to have been placed in a cigar box in the oven to keep her warm, and she obtained the nickname when her father remarked that she looked like a "doll." When the federal census was enumerated in 1880, the Trouts resided in East Huntington Township, Westmoreland County, PA. Their home was east of the South West Rail Road (SWRR). Isaac's occupation was shown as a coal miner. Over the years, he rose to the position of mine foreman for the Mt. Pleasant Coke Company. 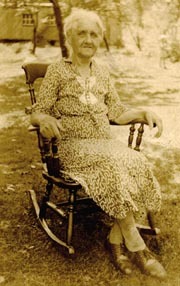 Emma is seen here later in life, seated in a favorite rocking chair. The Trouts later relocated to Foxtown, Hempfield Township Westmoreland County, where Isaac and his sons kept a grocery shop in the first floor of their home. The 1900 census shows the Trouts living in Hempfield, with Emma's aged parents also living under their roof. Isaac worked that year as a farmer. After Emma's father died in 1907, her widowed mother came to live with them in their residence above the storeroom. In November 1909, about one o'clock in the morning, fire broke out in the home, and the building was "totally destroyed by fire. The origin is unknown," said the Greensburg Daily Tribune. "Practically no insurance was carried." Emma's mother had a narrow escape and lost all her clothing and shoes, as well as her papers entitling her to receive her late husband's Civil War pension. The census of 1910 shows the Trouts in Hempfield, with Emma's mother residing in their home, and Emma's sister and brother in law, Bertha and Samuel VanDyke, living next door. Isaac's occupation was "merchant" in his "grocery" while his brother in law Samuel VanDyke was a blacksmith for a coal company. Sadly, suffering from acute organic heart disease, Isaac died at the age of 62 on March 14, 1911, just two years after the fire. He was laid to rest in the Stone Church Cemetery near Foxtown. Emma outlived Isaac by nearly three decades. Said the Connellsville Daily Courier, "She was a member of the Captain George Cribbs Circle of the G.A.R. of Greensburg." 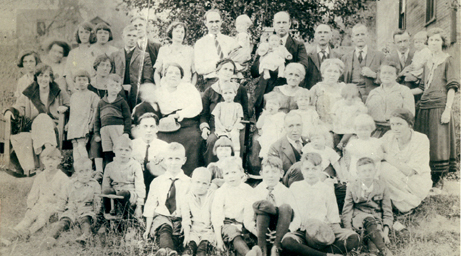 Emma seated just to the right of center at a Trout reunion, date unknown. In August 1930, Emma and Anna Belle, and Emma's sister Bertha VanDyke, attended the annual Minerd Reunion, held at Shady Grove Park in Uniontown. They gave their names to distant cousin Laura Jane (Minerd) Williams, who later wrote a lengthy account of the event for her local newspaper back home, the Huntingdon (PA) Daily News. Stricken with liver cancer and chronic heart disease, Emma passed away at home at Foxtown at the age of 85 on March 15, 1939. At her passing, said the Courier, she was survived by 19 grandchildren, 29 great-grandchildren and three great-great grandchildren. On her death certificate, signed by son John, her maiden name was spelled "Minert." 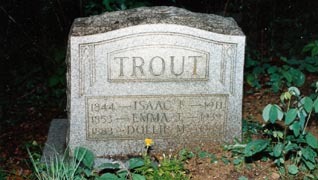 The Trouts are buried together with their daughter Dollie. Also resting nearby are Emma's parents, her sister and brother in law Bertha and Samuel VanDyke, as well as her brother Andrew Minerd, who was killed in a coal mine accident in 1919.